Mediscribes Selected by Singing River Health System as Dictation/Transcription Service Vendor | ezDI, Inc. | The only fully integrated born-in-the-cloud Speech to Text, Clinical Document Improvement, Coding, Auditing and Analytics platform on the planet. 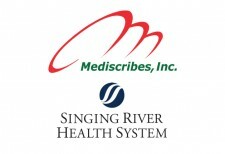 Louisville, KY, June 7, 2018	(Newswire.com) - ​Singing River Health System, one of the largest employers on the Mississippi Gulf Coast, has selected Mediscribes, Inc. to serve as its dictation and medical transcription service vendor for the system. “We are quite proud to add a prestigious partner like Singing River Health to our transcription customer base,” said Terry Ciesla, Executive Vice President for Mediscribes. “The team at Mediscribes is super excited about our selection and we are looking forward to delivering Singing River Health with an unparallel level of service, focus, and commitment." Mediscribes is a leading healthcare informatics and clinical documentation provider. Headquartered in Louisville, Kentucky, Mediscribes provides intuitive solutions that focus on positively impacting a healthcare customer's entire clinical documentation operation. With a cloud-based dictation/transcription system, automated workflow includes e-signature, interfacing, printing and faxing. Mediscribes also delivers cutting-edge CAC technology that combines Natural Language Processing (NLP), Deep Machine Learning, Semantic Web, and High-Performance Computing. The goal is to put operational data in the hands of healthcare professionals to help them proactively identify patients at risk, patterns in disease and treatment outcomes.